(21412.M9.6, Z. P. Meyers/Barney Hillerman Photographic Collection, OHS). (20738-T-9-1, Edna Mae Couch Collection, OHS). A cattleman, oilman, and capitalist, Charles Francis Colcord was born August 18, 1859, on a large plantation near Cane Ridge, Paris, Kentucky, to Maria Elizabeth Clay and William Rogers Colcord, a Confederate colonel in the Civil War. After the war ended, the Colcords moved to a sugar plantation north of New Orleans, and young Colcord received a limited education. A mosquito-infested swamp near the plantation caused him to contract malaria. Consequently, the youngster was sent to live on a family friend's ranch near Corpus Christi, Texas. By age twelve he had learned to herd cattle. In 1876 Charles Colcord and his father drove a herd from Texas along the Chisholm Trail through Texas and Indian Territory to Caldwell, Kansas. They decided to stay in Kansas and lived near Medicine Lodge in Comanche County. Colcord's father organized the Jug Cattle Company and later combined resources with other men to form the Comanche Pool, approximately sixty thousand cattle. While in Kansas, Charles Colcord married Harriet Scoresby on February 9, 1885. After a brief residence near Flagstaff, Arizona, the Colcords moved to Oklahoma Territory. Buying a team of horses and a wagon, Colcord participated in the Land Run of 1889, first staking a claim in Hennessey. Immediately selling his claim, he arrived in Oklahoma City on April 23, 1889. Under the city's provisional government he became the first police chief. 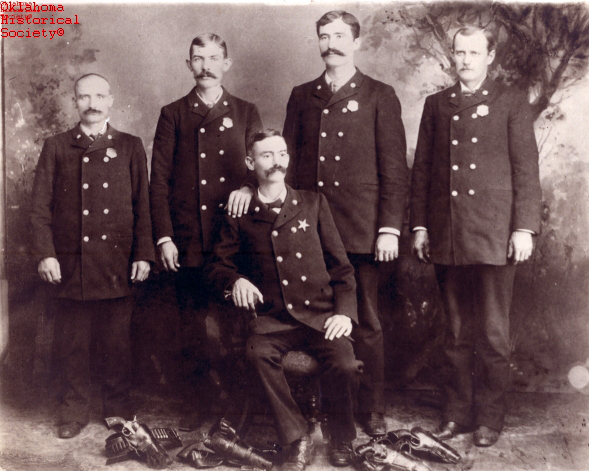 Continuing in law enforcement, he served as Oklahoma County's first sheriff when the county was organized in 1890. He also participated in the 1893 Cherokee Outlet Opening, made a claim in Perry, and farmed and served as deputy U.S. marshal. 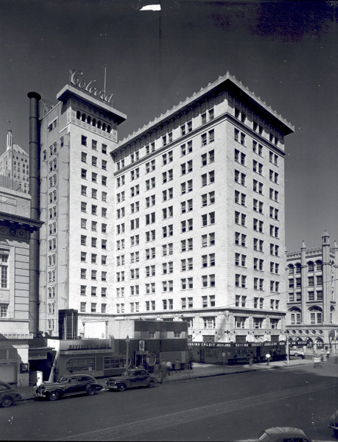 By 1898 Colcord had returned to Oklahoma City and became one of its pioneer developers and civic leaders. He founded the Commercial National Bank of Oklahoma City and served as its first president. In 1902 Colcord built a Classical Revivall–style mansion, modeled after his Kentucky childhood home, at 421 West Thirteenth Street in Colcord Heights Addition. In 1909 he and Anton H. Classen, in association with the Industrial District Company, promoted the establishment of the first meat-packing firm at the Oklahoma City Stockyards. From wealth gained through oil speculation in the Glenn Pool field and other Oklahoma locations, he built the $750,000, twelve-story Colcord Building in Oklahoma City in 1910. That same year Colcord and other city leaders promoted moving the territorial capital from Guthrie to Oklahoma City. Instrumental in the construction of the Commerce Exchange Building and the Biltmore Hotel, he developed residential areas such as Orchard Park and the Parker-Colcord Addition. Between 1917 and 1920 he participated in the development of the South Bend oil field in West Texas. In 1918 he organized the North American Oil and Refining Company, serving as president. Due to Colcord's background in the oil industry Pres. Woodrow Wilson appointed him to the National Petroleum Conservation Board that same year. A Democrat in politics, Colcord was president of the Oklahoma City Chamber of Commerce in 1914 and president of the Oklahoma Historical Society during the 1920s and 1930s. The town of Colcord in Delaware County, Oklahoma, was named in his honor in February 1930. Before his death on December 10, 1934, at his Delaware County ranch, he was inducted into the Oklahoma Hall of Fame (1929) and had achieved the thirty-second degree of the Masonic Order. With a police honor guard, his body lay in state at the Oklahoma Historical Society building. Buried in Fairlawn Cemetery at Oklahoma City, he was survived by his wife and six children. "Charles F. Colcord," Vertical File, Oklahoma Historical Society, Oklahoma City. Charles Francis Colcord, The Autobiography of Charles Francis Colcord, 1859–1934 (Tulsa, Okla.: C. C. Helmerich, 1970). Richard Lloyd Jones et al., eds., Oklahoma and the Mid-Continent Oil Field: The Story of a Great New State and Man's Quest for Oil ([Oklahoma City]: Oklahoma Biographical Association, 1930). Linda D. Wilson, "Colcord, Charles Francis," The Encyclopedia of Oklahoma History and Culture, https://www.okhistory.org/publications/enc/entry.php?entry=CO020.